MUSIC: The third annual ALL CAPS! Outdoor Show is finally upon us. The event is presented by Ryan McLaren’s ALL CAPS! 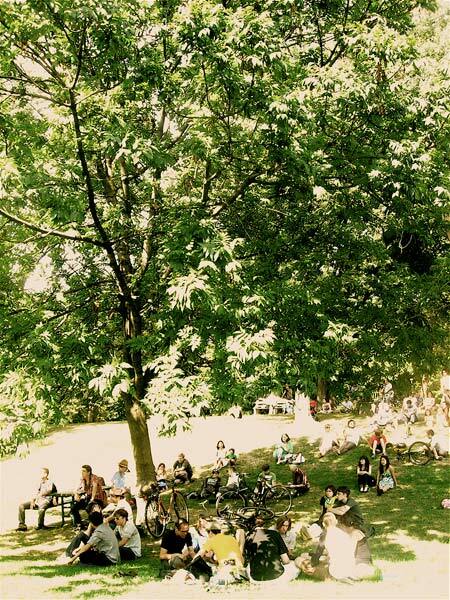 concert series, in association with Wavelength Music Arts Projects and Dufferin Grove Park. This year’s lineup is pretty stacked, and will include performances by The Miles, Huckleberry Friends, Feuermusik, The Youngest, and Hooded Fang. There will also be a barbecue and a mixed CD trade! Dufferin Grove Park (875 Dufferin Street), 2 p.m., FREE. FESTIVAL: In case you haven’t quite gotten your festival fix this weekend, the eighth annual Toronto Chinatown Festival kicks off today, with its opening ceremony at noon. There will be martial arts performances, traditional Vietnamese and Chinese dancing, tai chi, and magic shows. As well, participating restaurants and street vendors will be offering discounted meals. On Dundas Street (between Augusta Avenue and Beverley Street) and Spadina Avenue (between Sullivan Street and College Street), 11 a.m., FREE. BENEFIT: Toronto’s Community Bicycle Network is having a donation drive and open house today. Visitors are encouraged to donate old or used bikes and bike parts to the CBN, and take a look around the premises. Community Bicycle Network (761 Queen Street West), 12 p.m., FREE. WATER: After the success of May’s event, Ontario’s Largest Water Fight is returning today for Round 2. Water balloons are forbidden for the sake of the environment (unless, as their Facebook event page says, people are willing to volunteer to clean up). Christie Pitts Park (750 Bloor Street West), 2 p.m., FREE. Photo of last year’s ALL CAPS! Outdoor Show by suckingalemon.